As the workplace becomes increasingly diverse and collaborative, many health care professions and education programs have recognized the importance of building a leadership culture through mentoring. 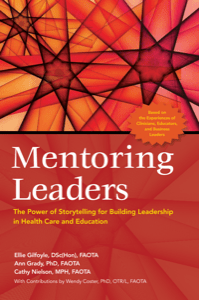 Mentoring Leaders presents a unique guide on this fundamental topic by demonstrating how storytelling can powerfully inspire, motivate, and teach both mentors and mentees. Going beyond the traditional one-to-one model of mentoring, this reader-friendly text provides in-depth discussion on various ways and forms mentoring can place, including group and offsite mentoring. A workbook offers readers many stories reflecting the core concepts as well as questions for self-reflection. Mentoring Leaders is an entertaining yet instructive guide for experienced and novice mentors and mentees who seek to become—and inspire—future leaders.